With under 100 miles to go before she crosses the finishing line CAMPER with Emirates Team New Zealand is slowly closing in on Puma, having made a 3-mile gain on the leg leaders in the last hour. It will be a painful few hours for Chris Nicholson and the crew, who after 4800 miles are still within touching distance of the leading boat. CAMPER is currently approaching the second way point at Great Isaac Light before making the final tactical decision as to how best to cross the Gulf Stream that stands between them and the finish line in Miami. 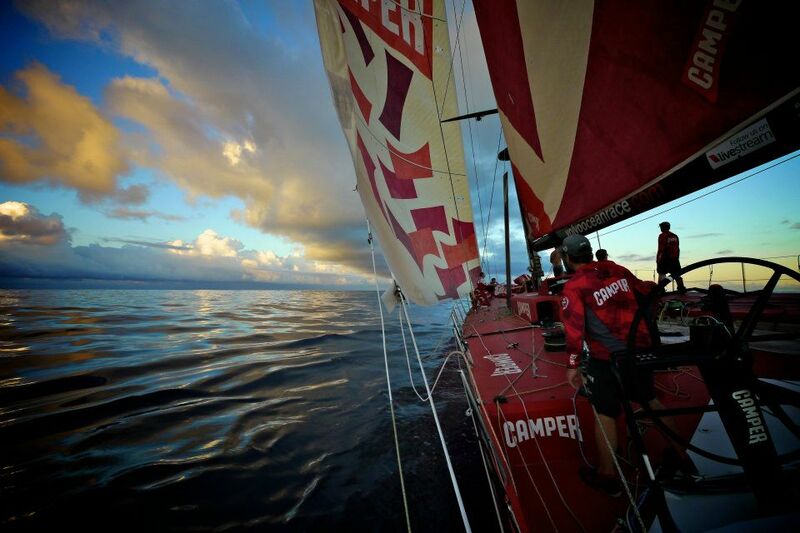 “We have had quite a few close finishes in this race and Puma has sailed very well to date. But of course if they do hit a light patch or get into a thunderstorms – then 20 miles is not much. They are in a good position at the moment, but if it blows up on the final approach into Miami then we have every chance, as we have seen in previous finishes,” commented Will Oxley, CAMPER’s navigator earlier today. Will and the team are currently looking at how best to take advantage of the Gulf Stream but very much aware that any moves that they make will be shadowed by Ken Read’s Puma. “They’re not dummies on board Puma and they have done a great job. You have probably noticed that we have been trying a few things and they have done a great job of covering those moves and I imagine that they will do the same thing through the Gulf Stream.” He concludes. CAMPER is currently sailing a slightly more southerly course and both boats are averaging speeds of about 13 knots. CAMPER’s expected ETA into Miami is about 1600h UTC this afternoon.